It's Set: Jimmy Fallon To Replace Jay Leno On 'Tonight Show' In Spring 2014 : The Two-Way This time the switch will stick, Leno insists. Unlike the ill-fated handoff to Conan O'Brien, this time Leno has been involved in the plans. 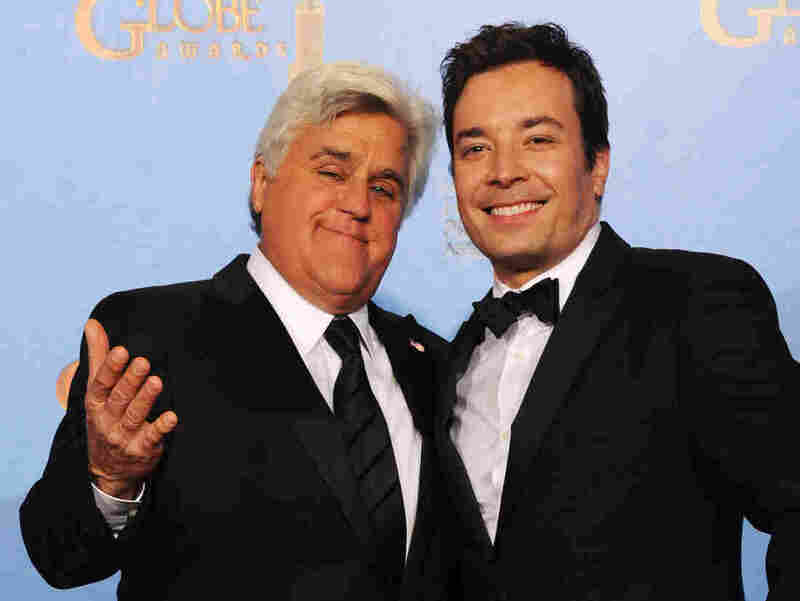 Jay Leno (left) and Jimmy Fallon at the Golden Globe Awards in January. Next year, Fallon will be taking Leno's place on The Tonight Show, NBC says. -- "JUST IN: Jay Leno will depart NBC's 'Tonight Show' in Spring 2014; Jimmy Fallon to replace, NBC says." -- "MORE: 'Tonight Show' will return to New York City in 2014; Lorne Michaels will be executive producer." As our Monkey See friend Linda Holmes has correctly said, the "late-night wars are so boring." Still, as The New York Times points out, The Tonight Show is "the most storied and successful program in late-night television." And this will return the show to where it started — New York. "The main difference between this and the other time is I'm part of the process. The last time the decision was made without me. I came into work one day and — you're out. ... [Now] there really aren't any complications like there were the last time. ... This time it feels right." The Jay-to-Jimmy switch has been talked about for weeks, of course. Last night, the two funnymen sang about the saga. Update at 1:50 p.m. ET: We're adding a question (it's not a scientific survey of public opinion, by the way). What do you think of the 'Tonight Show' switch from Jay Leno to Jimmy Fallon?